After a good seven months forward from this original teaser post on Summer in Bangkok July 2013, here I am revisiting the highlights (food wise, of course .. no shady stories on this blog lah, sorry!) of the seven days of bliss in Bangkok, Ayuthaya and Pattaya. The Fat Beagle Cafe & Bake Shoppe is located on a relatively quiet lane off the main road of Sukhumvit in Bangkok; it takes a bit of effort to reach here from the nearest train station though. 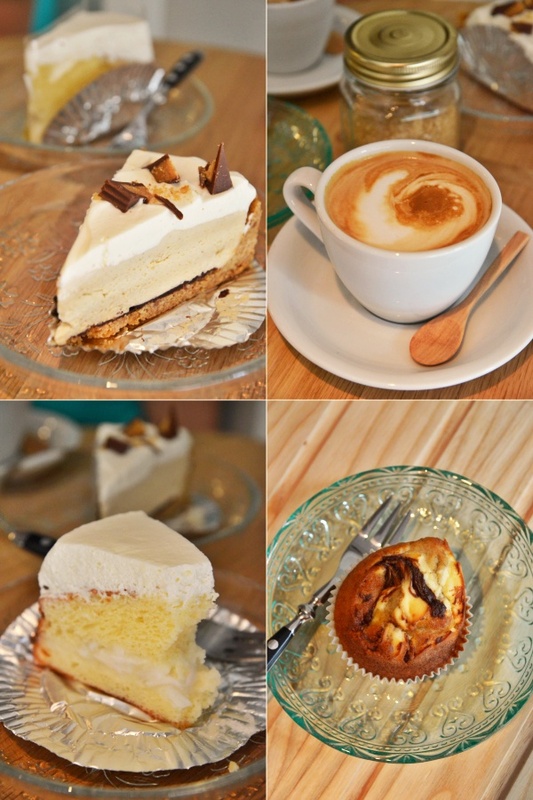 But the cakes are well worth the walk ..
Rather unconventionally, instead of doing the Bangkok Street Eats, let’s take a detour off to Sukhumvit area for a brunch of lovely cakes, cookies and coffee at The Fat Beagle; a barely one-year old establishment. It’s so common to be greeted by mouthwatering whiffs of freshly grilled meats by the street side, and sights of dark-skinned, friendly hawkers frying up a storm with their rendition of ‘pad thai’ – the ultimate icon of Bangkok’s street food. But to look beyond the stereotyped spicy fares, there is so much more to Bangkok than being a street food haven. 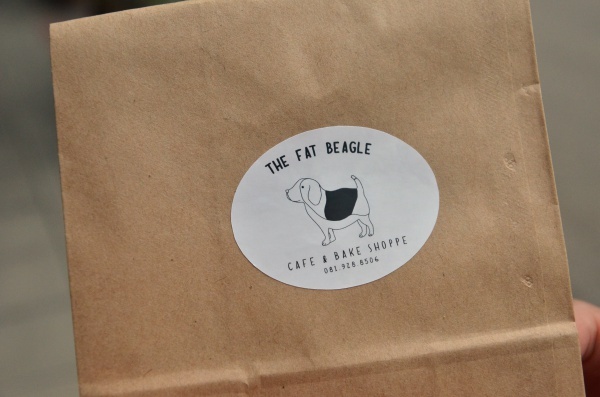 The Fat Beagle excels in their freshly baked cakes and cookies; served with a selection of coffee in a tiny space suited for no more than half a dozen of people. Set against a backdrop of high rise apartments and hotels, The Fat Beagle sits quietly in the middle of Soi Sukhumvit 33. The wooden flooring and panels with high tables & stools with magazines for browsing made for a refreshing experience; a cafe that’s not built for the masses. It took us some time locating for this cafe though. Alighting at BTS Phrom Phong, we walked a good 15 minutes or so before reaching the cafe slightly past 11am. That’s their opening hour, by the way. So don’t come waltzing in expecting breakfast to be served. Being a strictly cakes and coffee place, The Fat Beagle is designed as such without the need for a menu. Walk up to the counter and pick your slice of cake or muffin, or choose from their range of freshly baked cookies of the day. We picked a few selection of cakes from their display; the best amongst them was the Peanut Butter Cheesecake which was rich, creamy, nutty with a tinge of saltiness from the peanut butter set on a crumbly cookie base. The Young Coconut Fresh Cream Cake encompasses the spirit of Thailand well; being a light and fluffy sponge cake with an airy layer of coconut cream atop. The Banana, Nutella and Cream Cheese Muffin sounds like a dense, diet freak’s night mare on paper but yet came across rather mild; in comparison. Still tasty nonetheless. I bought a piece of Chewy Chocolate Chip Cookie (40B/MYR4/USD1.20) and nibbled on it while walking back to the station. And boy oh boy, did I regret for not buying at least a dozen of this! Really good cookie that beats most competitors back home in Malaysia. Seriously. Decorations are cute, dainty and slightly quirky yet not to the extent of overpowering the overall ambience. At least you don’t get choked to death by the vintage paraphernalia and random retro parts thrown in for good measure. And at this point of time I was wishing that I had at least a dozen of the cookies with me to bring home.Shucks. *Take the BTS to Phrom Phong station, alight and walk north bound towards Sukhumvit Soi 33. You will be walking along the main road of Thanon Sukhumvit. Just as you passed by The Londoner Brew Pub on your right, turn right into Soi Sukhumvit 33. Keep on walking along this road and until almost the end of it, you will see The Fat Beagle on your left.